A rotary evaporator (or rotavap/rotovap) is a device used in chemical laboratories for the efficient and gentle removal of solvents from samples by evaporation. Rotary evaporators are also used in molecular cooking for the preparation of distillates and extracts. 1. A motor unit that rotates the evaporation flask or vial containing the user's sample. 2. 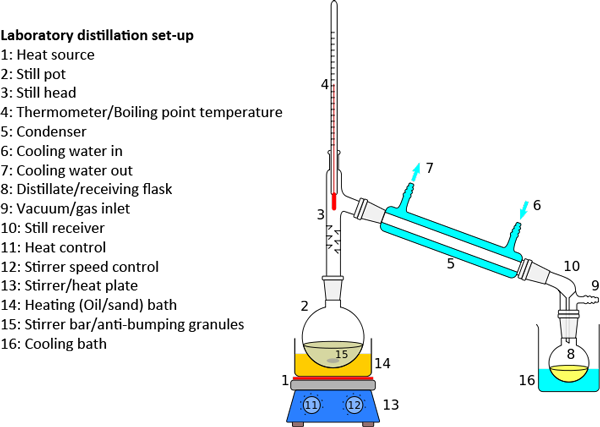 A vapor duct that is the axis for sample rotation, and is a vacuum-tight conduit for the vapor being drawn off of the sample. 3. A vacuum system, to substantially reduce the pressure within the evaporator system. 4. A heated fluid bath (generally water) to heat the sample. 5. A condenser with either a coil passing coolant, or a "cold finger" into which coolant mixtures such as dry ice and acetone are placed. 6. A condensate-collecting flask at the bottom of the condenser, to catch the distilling solvent after it re-condenses. 7. A mechanical or motorized mechanism to quickly lift the evaporation flask from the heating bath. The vacuum system used with rotary evaporators can be as simple as a water aspirator with a trap immersed in a cold bath (for non-toxic solvents), or as complex as a regulated mechanical vacuum pump with refrigerated trap. Glassware used in the vapor stream and condenser can be simple or complex, depending upon the goals of the evaporation, and any propensities the dissolved compounds might give to the mixture (e.g., to foam or "bump").